Isuzu currently has total of 2	car models in India. Isuzu Cars price starts from ₹ 21,53,000 . Click on the below images to see the details of each models. Isuzu is a Japanese car company which is over 90 years old.The history of Isuzu can be traced back to its earliest antecedent company, Tokyo Ishikawajima Shipbuilding & Engineering Co. Ltd., who has decided to foray into the automobile manufacturing business in 1916, using capital amassed from its highly profitable shipbuilding business.In 1918,a passenger vehicle production venture in a tie-up with the British automaker Wolseley Motor Ltd was started . The first car of the company that was ever made in Japan known as Wolseley A9- yield the company with great success,that resulted in production of further of further passenger car models that include Hillman Minx, Florian, 117 Coupe and the Bellett.But in the same year, the "Sumida" appeared, the Car Department was split off from Tokyo Ishikawajima Shipbuilding & Engineering and established as an independent company named Ishikawa Automotive Works Co. Ltd., On April 9,1937,which the Isuzu regarded as the foundation of the present Isuzu Motors Ltd, merged with Tokyo Gas & Electric Co. to establish Tokyo Automobile Industries Co., Ltd. It was only in 1981 that the Isuzu car company decided to enter the profitable market and formed a partnership with world auto giant, General Motors Inc of US,after which the the functioning of the car company has been based more on its partnership.The General Motors had heavily invested into Isuzu and picked up a 12% stake in the company. The company has not rolled out a car since many years. Isuzu has been running in troubled waters for some time now.But still their pick up trucks are the ones that hold majority of sales,that made the company to see its future in the niche in the commercial vehicle supplier and diesel engine manufacturer. Currently Isuzu has only SUVs and trucks in its wings to offer. Now claiming our country as its “larger consumer base of the country”, Isuzu has planned to strengthen the carmaker’s presence by inaugurating its first dealership in Noida.It offers its MU-7-SUV to its prospective markets in North India that will be further expanded in south India. Already Own a Isuzu Car? * Isuzu may not sell all the car listed here in all showrooms. Price of Isuzu car listed here are dealer price only not the on road price of the car. Isuzu car pictures are for representation purpose only. 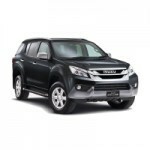 To book and know the on road price of any Isuzu car click the buy now button.